Need to practice your reading? 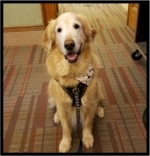 If so, the library's "Bow WOW for Books" is just the thing for you. Our dog friend, Prince, and his handler, Joyce, love a good story! Prince and Joyce will be here on select Wednesdays from 5 PM - 6 PM. Readers can sign up for 15 minute slots. Reserve your spot by calling the Children’s Desk at 978-674-1529. *Prince and Joyce are affiliated with Therapy Pets Unlimited.